Take care with what you eat while pregnant! Food choices will make a huge difference to your health and the health of your unborn child. The foods that you choose to eat while you are pregnant will influence your health and the baby’s well being immediately after birth and perhaps for years to come. Pregnancy is a good time to review your diet and pay special attention to the nutrition that’s best for both of you — and to take care to avoid the foods that can be harmful. Pregnant women need to stay energised with protein, including eggs and poultry, and should include healthy carbohydrates in their diet. Good sources for carbohydrates are fruits, vegetables and cereals. Add healthy fats to your meals and snacks with olive oil and nuts, and be sure to stay fully hydrated by drinking plenty of water every day. Balanced nutrition is vital for a healthy mother, a healthy baby and a healthy family! Pregnant women are at greater risk for foodborne illness because the hormonal changes in their bodies during pregnancy weaken their immune systems. They must take greater care to wash their hands before and after food preparation, cook well and handle meat, fish, eggs, and poultry properly. During your pregnancy, cook eggs until they are firm set. Thoroughly wash fresh produce — a long rinse is in order for all fruits and vegetables before eating them. Soft cheeses such as unpasturised brie, feta, camembert, blue cheese and other soft varieties should be eliminated from a pregnancy diet. Fatty fish like salmon, herring and sardines are excellent, but another important food to avoid is any fish with a high mercury content. Consuming fish with high levels of mercury has been linked to developmental delays and even brain damage in babies. Decreased attention, memory and lower IQ are just some of the possible serious effects. If you are not sure which fish choices are appropriate, check with your physician or your local Health Department to determine which fish in your area is safe to eat. Fish that are known to have mercury levels too risky for pregnant women are shark, king makerel, tilefish and solid white albacore tuna. Never eat these varieties when you are pregnant. Raw meats, such as sushi and seafood — especially shellfish, rare or uncooked beef and poultry — are also out. 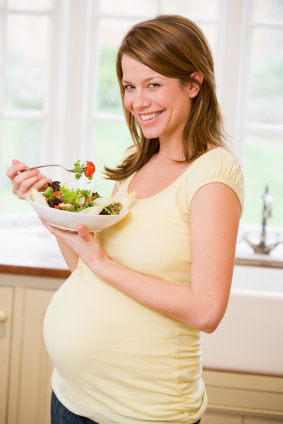 During your pregnancy they pose the risk of coliform bacteria, toxoplasmosis, and salmonella. While these bacteria may sicken anyone, they are of special danger to pregnant women. Many deli meats, including hot dogs, can easily be contaminated with listeria bacteria which could result in a miscarriage. It’s safe to eat deli meat only if you heat it to steaming hot… otherwise, avoid it! Raw eggs may contain salmonella, and they are often used in Caesar salad dressings, mayonnaise, homemade ice cream and custards or Hollandaise sauce. They are also an ingredient in unpasturised egg nogs. Before you eat any of these items, know exactly what the ingredients are. The safest strategy for you and your baby is to completely eliminate them — and other risky food choices — from your diet during your pregnancy.